Like it or not, we are in the middle of a social networking revolution. And of course, that’s hardly news. Endless ink, digital and otherwise, has been spent on worrying over whether Facebook, Twitter, and their rapidly-multiplying ilk are the best or the worst thing that has ever happened to humankind. A recent story about car-pooling apps highlights the fact modern technology, including social media, has a role to play in making markets more efficient. And since efficient markets are generally a good thing, this counts as a big checkmark in the “plus” column of our calculations concerning the net benefit of social media. 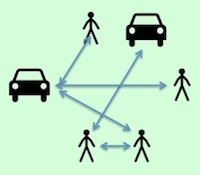 Carpooling is a great example, because the relative lack of carpooling today is a clear instance of what economists call “market failure” — a situation in which markets fail efficiently to provide a mutually-beneficial outcome. Think of it this way. There are lots of people in need of a ride. And there are lots of people with rides to offer. The problem is a lack of information (who is going my way, at what time?) and lack of trust (is that guy a potential serial killer?) Social networking promises to resolve both of those problems, first by helping people coordinate and second by using various mechanisms to make sure that everyone participating is more or less trustworthy. With regard to car-pooling, the obvious benefits are environmental. But the positive effect here is quite general: just about any time we find a way to foster mutually-advantageous market exchanges, we’ve done something unambiguously good. This is one example of the ethical power of social media. Another big enemy of efficient markets is monopoly power, or more generally any situation in which a buyer or seller is able to exert “market power,” essentially a situation in which some market actor enjoys a relative lack of competition and hence has the ability to throw its weight around. Social media promises improvements here, too. Sites like Groupon.com allow individuals to aggregate in ways that give them substantial bargaining power. The general lesson here is that markets thrive on information. Indeed, economists’ formal models for efficient markets assume that all participants have full knowledge — that is, they assume that lack of information will never be an issue. Social networks are providing increasingly sophisticated mechanisms for aggregating, sharing, and filtering information, including important information about what consumers want, about what companies have to offer, and so on. So while a lot of attention has been paid to the sense in which social media are “bringing us together,” the real payoff may lie in the way social media render markets more efficient.